Who's Leading Your Digital Transformation? Accenture’s latest CMO Insight Survey, CMOs: Time for Digital Transformation, or Risk Being Left on the Sidelines, reminds us that we’re in the midst of a digital transformation. The report outlines challenges and opportunities of true digital transformation; it calls out high-growth organizations (those with a self-identified increase of 6% or more in annual sales) and what they’re doing differently. It also offers actionable areas of focus for organizations looking to become digital businesses. All of this, however, needs an owner—someone to lead the charge, own technology and experience, and translate across business units. CMOs’ lack of big-picture digital thinking, including the customer experience, technology and intelligence, has paved room for emerging roles (chief digital officer, chief customer experience officer, etc.) to fill the gap. Harness the power of the latest digital technologies. Integrate platform technologies across traditional, functional boundaries. Collaborate with c-level executives across departments. Bring an omni-channel customer experience to life. Understand customer data and intelligence to put insight into action. 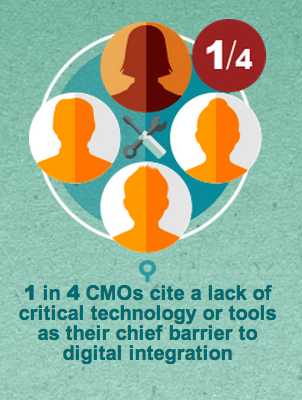 While “digital” continues to lead CMO agendas, it’s time to up the ante. Having a digital presence across web, social and mobile was the first step—but now it’s time to look at the experience from the lens of the omni-channel customer. How does customer experience work from one channel to the next, from digital to in-person? How does data and customer intelligence flow among channels to provide a 360* view on business outcomes? These are the questions CMOs are tasked to solve as they evolve to a more digital business. While most marketers are improving digital effectiveness, mobile presents a challenge (and opportunity). In the next five years, “mobile will account for over 50% of the marketing budget,” according to those surveyed. As more digital natives step on the scene, mobile will continue to be a gateway for customer experience and insights. It’s listed as an area of opportunity CMOs cannot afford to ignore when leading digital transformations across industries. Simply capturing and presenting analytics, however, is no longer enough. Trending insights and real-time data must be actionable to keep pace with digital transformation. High-growth companies surveyed are already using analytic insights to prove and improve bottom-line marketing impact. Cool Tip: Check out how Accenture has made the data from this survey interactive and more actionable with Tableau. With all the opportunity ahead for organizations on their way toward digital transformation, what are the barriers that prevent organizations from realizing its potential? The top three survey responses include lack of necessary technology, lack of new required skills, and lack of organization-wide tech integration. True digital transformation requires a tech overhaul, and the right talent to oversee, execute and teach others to adopt. How are you brining your organization’s digital transformation to life? How are you taking digital to the next level? We’re curious to hear if and how report findings are being put into practice. * The 2014 CMO Insights Survey is based on responses of 581 senior marketers, across 11 countries and 10 industries. For more information on survey demographics, see page 2 of the full report.